In this blog post we discuss the relationship between the use of mobile services and access to other financial services, particularly savings services and bank account holding. Our purpose is to show, on one side, how Malian users try to fit available mobile financial services to their saving needs, and on the other, to what extent mobile money can be a vector of greater bank access through the development of mobile savings. Our analysis of mobile money users’ financial profiles sheds some light on these questions. The market for mobile financial services is witnessing a significant growth in Mali and the UEMOA zone in general. (1) Between 2013 and 2014, the value of transactions increased by 122%, reaching 3,760 billion CFA francs at the end 2014 for 259.3 million operations. Mali occupies the second rank in the zone in terms of transaction value, with 20% out of 3,760 billion CFA francs. The country is even ranked first in terms of P2P transfers, realizing 47.48% of operations value in this category (BCEAO, 2015). Two mobile network operators (MNOs), Malitel and Orange-Mali, share the Malian market. Both offer mobile transfer and payment services. Mobile networks presently cover more than 40% of the territory and 40% of the population uses a mobile phone. In this context of low bank access and growing mobile phone utilization, the aim of our IMTFI-funded project has been to assess how mobile services are contributing to financial inclusion in Mali. Very frequent billboards on access to Mobile (here Mobile wifi) at the side of an avenue in Bamako. Access to the mobile network can contribute to financial inclusion through three possible channels. First, mobile financial services can increase the range of available financial services, thereby providing broader choice and eventually lowering prices. A larger suite of mobile products can benefit the entire population, independently of access to banks or other financial service networks. The second channel impacting financial inclusion are the linkages of banks to mobile users, which can facilitate access to bank accounts by reducing information requirements. Finally, competitive pressure may incentivize banks to win new customers by developing competing or complementary mobile services. From our observations in Mali, only the first channel is running, with the development of P2P transfer services proving to be valuable in the Malian context. However, the potential of this channel to lead to greater bank access remains limited. Indeed, the current bank/MNO cooperation model in supplying mobile services has so far not resulted in a lasting connection between banks and unbanked mobile users. The current cooperation between MNOs and banks is limited to the interface with the central bank, which guarantees electronic money. Our field data in Mali show that users of mobile financial services already possess a bank account, rather than the mobile account generating new bank accounts. This suggests that the use of a mobile account has not improved access to banks for new populations in Mali. A second important observation based on respondents’ financial profiles is the prevalent use of informal saving groups by men as well as women: 32% of the sample is a member of a ROSCA or other savings association. This figure is quite high given the greater participation of men in the study; women, 67% of whom are members, are culturally more accustomed to take part in these clubs than are men, but are less represented in our sample. In the Malian context, the search for adequate means of saving appears to be one of the reasons that men and women are juggling between different financial services. 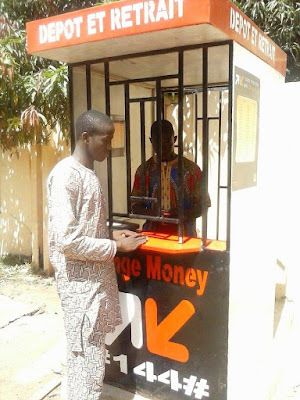 Indeed, the high demand for savings options actually calls for improved access to banks, because in Mali MNOs are not allowed to offer savings or investment products, which are available only through banks. Unless the mobile phone succeeds in creating a more sustainable relationship between users and banks, its effect will be minimal in facilitating clients’ access to an adequate suite of savings options. In the present context then, it seems that “bank educated” users are benefiting more from mobile financial services than the unbanked. For example, users with accounts at the partner bank of Orange Money (BICIM-Mali) can now make transfers free of charge between their mobile wallet and their bank account or vice versa. With the current trend in the development of mobile payment services, the gap between the banked and unbanked may increase if mobile phone use does not encourage new linkages between banks and mobile users. Users already accustomed to bank accounts will easily follow the trend, while those dependent on cash and without formal access to banks will have trouble. The model of commissions sharing between banks and MNOs for the m-payment service may privilege those already included in the formal financial system rather than encouraging unbanked mobile users' full access to banks. Our study underscores the saving potential of mobile users, which can be beneficial to banks. We observed in Mali, as studies have shown in other contexts, that respondents frequently use the mobile wallet for precautionary savings. In this sense, mobile transfers largely feed mobile saving in Mali. Mobile transfers are in fact a form of saving with the mobile phone, one that banks could channel toward greater financial inclusion. We conclude that given the extent of mobile network access and use in Mali, the development of new operating models between banks and MNOs could help to achieve a higher level of financial inclusion. These models must involve greater synergies between MNOs and banks, and facilitate more information and experience sharing in order to develop a wider range of bank services that can be extended to mobile users. The operational model based on partnerships between banks and MNOs is diversifying the scope of mobile financial services in the most mature markets in Sub-Saharan Africa. Mobile savings and short-term credits are now possible in leading markets like Tanzania (GSMA, 2015)(4). In the partnership model, each partner takes advantage of their strengths in reaching new customers: the mobile networks have the advantage of technology, physical access and operational costs reduction, while banks bring the necessary licenses and experience for savings collection and credit disbursement. Exploiting synergies is thus a key element in speeding up financial inclusion and can impact considerably the level of accessibility and diversity of mobile financial services. (1) BCEAO, (2015), Situation des services financiers via la téléphonie mobile dans l’UEMOA, BCEAO ; 24 pp. (2) In the sample, 71% of women have at least a secondary school level, compared with 43% for men. (3) Nevertheless, we point out that the price of mobile financial services is considered too high for users, as a large part of our sample (29%) reported that high cost is the greatest inconvenience in using them.